Beautiful family villa with Pool! Situated in the popular and well serviced lakeside town of Porlezza on Lake Lugano this beautiful detached 3 storey villa provides excellent accommodation for families and large groups. The spacious and well proportioned villa comprises of a modern and air conditioned sleeping accommodation (top floor only) with a bright living room which offers comfortable sofas, solid wood furniture, a flat screen SAT TV with DVD player for your entertainment and direct access through French doors onto the sunny covered terrace, which leads to the private garden and swimming pool. Inside a beautiful newly fitted kitchen leads off from the living room and offers all the desired appliances including eye level oven, coffee machine and gas hob. A dining table is also situated here and a CD player ensures you and your guests can enjoy music whilst preparing delicious lunches and dinners! An outdoor dining area with stone built BBQ features in the sunny garden enables guests to choose where best to enjoy a continental breakfast, light lunch or evening dinner party. The villa accommodates up to 11 people comfortably. The first floor offers three bright stylish double bedrooms, two of which offer access onto a sunny balcony overlooking the garden and pool. While on the second floor, there is the fourth bedroom with a bunk bed and further fifth bedroom with a bunk bed plus a single bed which is very ideal for the younger guests. The main modern family bathroom offers a separate bathtub as well as all the desired sanitary ware, a second modern bathroom offers a power shower in addition to all the desired sanitary ware. The property also offers a newly fitted cloakroom with a toilet and washbasin. Conveniently a washing machine and tumble dryer also feature in the villa. Please note that pets are not permitted to stay at this property. Porlezza offers a wide choice of local amenities including supermarkets, banks, cafes, restaurants, high street shops and also benefits from a regular bus service to Lake Como and Lugano city. Visitors can enjoy the lakeside promenade of Porlezza and can take advantage of the many activities on offer in the local area including cycling around the Lago di Piano nature reserve, hiking, swimming, horse riding, Golf, tennis, boat rental and discovering the lake district attractions including the cosmopolitan Swiss city of Lugano and the beautiful Villas and gardens on Lake Como. 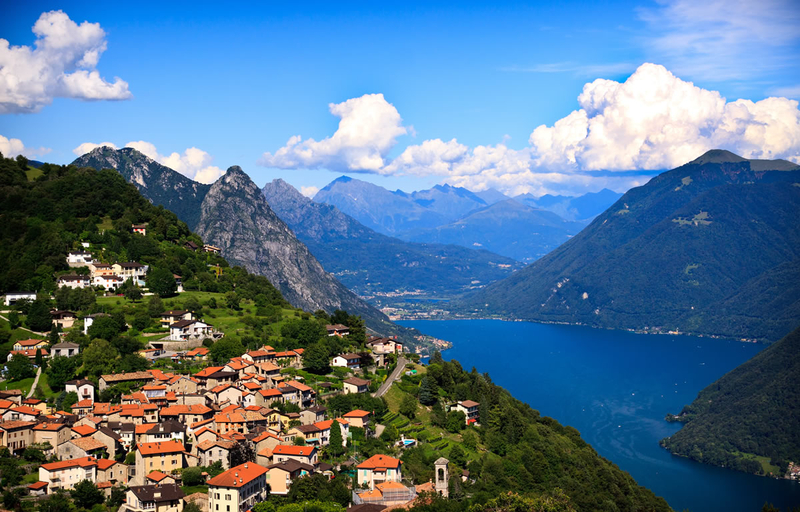 A car is advised for your stay to ensure you can easily reach and explore both Lake Lugano and Lake Como. Guests staying in the property are also able to enjoy the wide choice of facilities and activities at the family-friendly Porto Letizia holiday complex which is situated on the sunny Porlezza lakefront and which is just a few minute’s drive away! The complex offers parking with the main modern Palazzo providing a visitor information desk, laundry facilities, a hair salon and a computer shop. Visitors can enjoy the stunning lakefront terrace with its contemporary Panama cafe with outdoor seating and the contemporary Italian restaurant ideal for authentic alfresco dining. The evenings are fabulous here and locals gather to enjoy aperitifs and each other’s company as the sun sets over the lush mountain tops. A sunny lake front outdoor swimming pool, tennis courts and mini golf with children’s play area are perfect for daytime fun and the beautiful parkland is ideal for dog walking, cycling and jogging, with lovely areas to enjoy lunchtime picnics under the shade of trees. A sandy beach is also a fabulous feature of the complex and makes a great place to sunbathe, with the Lake Lugano providing the most stunning of backdrops! From the complex a bridge leads over a passing stream to the promenade of Porlezza where cafés, restaurants and ice cream parlours can be enjoyed and where the main lake road with frequent bus route passes through.